SAN DIEGO — An extensive two-year renovation of the Nielsen Beaumont Marine boatyard has been completed, at a cost of more than $2 million. One of the facility’s new features is a state-of-the-art 75-metric-ton marine Travelift that replaces the yard’s old marine railway system, allowing the business to haul out larger deep-draft boats. In 2011, Nielsen Beaumont began a complete remodel, with the goal to create a cutting-edge “green” facility. Now, the yard employs features that minimize contamination on shore and in the bay, with equipment that recycles water used for yard jobs for re-use in subsequent jobs. A closed-loop recycling system for all hydro-wash water and a capture and treatment system for all stormwater helped establish the yard as a zero-discharge facility. “This allows us to work more efficiently,” said Tom Nielsen, co-owner of Nielsen Beaumont Marine. Nielsen Beaumont Marine relocated its work to Mission Gorge in 2011 when work began on the boatyard, eventually moving back to the site in February 2012. The boatyard’s new 75-metric-ton (82.5 U.S. tons) marine Travelift operates with a wireless remote control system, and the lift features California Air Resources Board (CARB) compliant Tier 3 diesel engines. For larger sailing yachts, a “sail beam” — which is a 4-foot longer forward beam — allows for hauling out larger sailing vessels without having to remove any of the rigging. The lift’s hydraulic fluid is biodegradable mineral oil — and the engine compartment has extra soundproofing, which allows for a quieter and safer haulout experience. Two concrete piers were built to accommodate the lift. “The new lift allows us to haul longer, beamier and heavier vessels than we could with our old marine railway,” Nielsen said. “We have more than doubled our potential client base — and we can now haul out most yachts located in Southern California. “In addition, we can now haul fin keel-style sailboats, which we could not before we remodeled,” he added. The yard, located on Shelter Island, was once owned and operated by Tony Mauricio and his father in the 1950s. Operating under the name Mauricio & Sons Boatbuilding, the boatyard changed hands in 1988 when Tom Nielsen and Don Beaumont purchased it — renaming the business Nielsen Beaumont Marine. 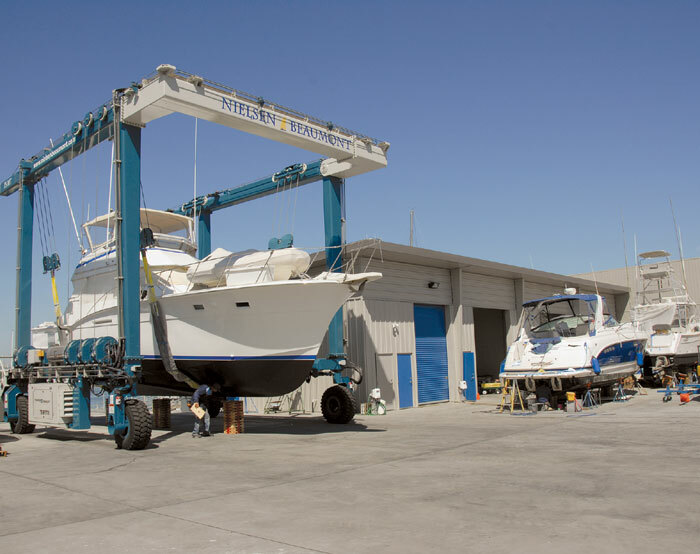 Since that time, the marine business has serviced sail, power and military vessels, offering a full range of yacht repair, maintenance and restoration services. Engine repair, ship systems, surveying, welding and fabrication services are offered at the yard, along with fiberglass repair, rigging, painting, refinishing and carpentry. A newly rebuilt two-story building houses a conference center, the company’s shops, including mechanical and welding offices, and cruiser dealership offices. In addition to the yard’s enhancements, the company has hired Bill Campbell to manage the boatyard operations. Campbell brings a lifetime of boating and sailing experience and has participated in three America’s Cup campaigns. He brings to Nielsen Beaumont an extensive knowledge of all aspects of yachting and sailing, Nielsen said.